Welcome to my blog, which includes special posts for teachers and students. Here I’ll share information about my books (including various giveaways), writing prompts, book and research recommendations, events, and wee bits and pieces about my beloved Scotland. Posted September 4, 2017 by Diane & filed under My Books. One of the hardest things for young writers to remember is that a work of writing isn’t finished when you reach the end of the paper or file. Revision, that frightening word, is next. But that can be hard to appreciate. For many students, writing is simply hard, and rewriting an agony. In elementary and middle schools across my region of Maine (which are about to begin the 2017/2018 school year), students will starting new writing projects and many will be working on revision. I know from my own experience as a young writer how challenging this can be. I remember the satisfaction I felt when I had spell-checked and printed a piece of writing. It was done, I thought. It took me years to understand that the end of a first draft of fiction or nonfiction is only the beginning. I’m doing what I can as an author to help students learn that revision is both necessary and not something to fear. In one of my favorite parts of my author presentations, I talk about revision and rewriting. 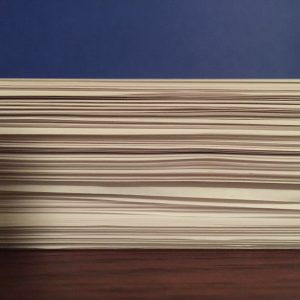 I share approximately how many pages I threw away in writing my debut novel and I show students a stack of pages (prompting various sounds of surprise or horror from the audience). I explain the kinds of things I changed, what aspects stayed the same, and how good it felt to make those changes and see the novel grow. And I tell students what to look for in their own writing, and the importance of accepting constructive criticism. I’m hoping that with this part of my presentations, I’m encouraging students to feel okay (or even good) about revising their writing, and to start seeing it as a crucial—and wonderfully fulfilling—part of the writing process. That stack of paper, by the way, remains on view throughout my entire presentation. In my upcoming ones, it will sit beside the final product: a printed book. What better way to show what the result of revision can be. Subscribe to blog posts and my occasional e-newsletter, where I’ll summarize posts and share additional news and other links.